Hello there, we are always raving and ranting that Econet is a crap company bent on suiting their own needs. They make wide changing policy shifts without communicating with us their customers! We purchased a Facebook Bundle and to our surprise, we only connected for 2 days! The bundle then stopped connecting and we were taken aback! We got in touch with them and we got hundreds of silly responses! From maybe your phone is dead to we are resetting your line. To our shock, we received the message above! 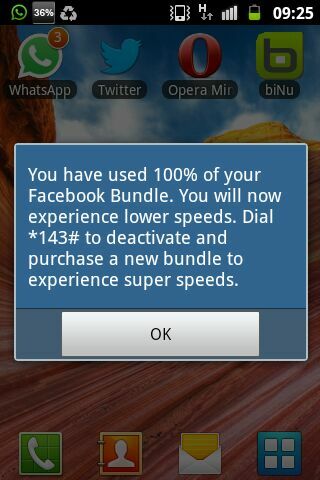 What it means in simple terms is that your Facebook bundle is no longer ‘unlimited’ but is now throttled! It means that Econet will switch you off when they feel you have used enough data! Now it means those are no longer weekly or monthly bundles but are now usage based bundles! Extra Bundles cost $2 a week and $6 a month and these will allow downloading! Lite bundles will cost the normal fees and will not allow downloading!